The MEDA DC Magnetic Field instruments use flugate technology to accurately measure the components of a magnetic field. The RM100 Nanotesla meter is the most accurate (0.01%) single axis fluxgate magnetometer on the market and has a resolution of 0.1 nT. 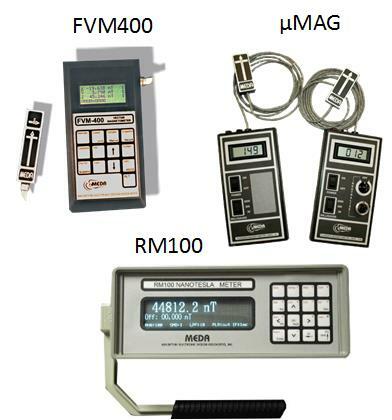 The FVM400 is a portable three-axis handheld magnetometer that measures the three components of a magnetic field vector over a 100,000 nT range to a resolution of 1 nT. The µMAG Series magnetometers are portable single axis handheld instruments that measure the component of a magnetic field along one direction over a range of 200,000 nT with a resolution on its most sensitive range of 1 nT.